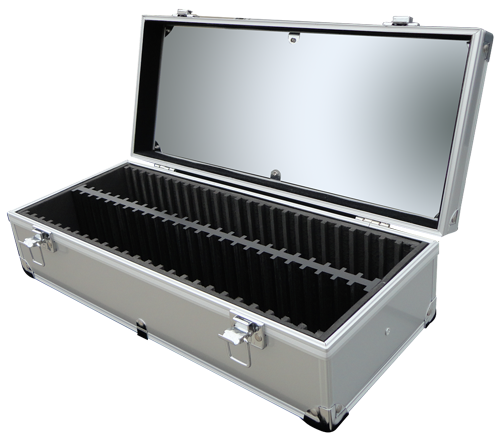 Just as its title suggests, this Guardhouse aluminum box holds 50 certified coin slabs from the major grading services. What is unique about this box is that it can hold both NGC and PCGS slabs interchangeably. It is designed with slotted foam rails that hold each slab in place and separated from the one next to it to prevent scratching. It is a sturdy aluminum box with clasping lid locks and a see through plexiglass top. Use as an attractive display of your best coin collection or to keep your coins secure while travelling. Will this accomodate the NGC slabs that hold high relief coins? they are about 50% thicker than a regular slab. Yes, this box has a foam rail system that can accommodate different size slabs in the same box.